The Near-Earth Object Program Office at NASA's Jet Propulsion Laboratory in Pasadena, Calif., has not changed its current estimates for the very low probability (1 in 45,000) of an Earth impact by the asteroid Apophis in 2036. Contrary to recent press reports, NASA offices involved in near-Earth object research were not contacted and have had no correspondence with a young German student, who claims the Apophis impact probability is far higher than the current estimate. This student's conclusion reportedly is based on the possibility of a collision with an artificial satellite during the asteroid's close approach in April 2029. However, the asteroid will not pass near the main belt of geosynchronous satellites in 2029, and the chance of a collision with a satellite is exceedingly remote. Therefore, consideration of this satellite collision scenario does not affect the current impact probability estimate for Apophis, which remains at 1 in 45,000. 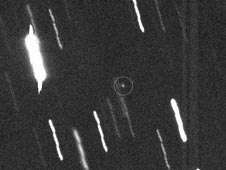 NASA detects and tracks asteroids and comets passing close to Earth. The Near Earth Object Observation Program, commonly called "Spaceguard," discovers, characterizes and computes trajectories for these objects to determine if any could be potentially hazardous to our planet. So which is it? 1:450 or 1:45000? Would tend to trust NASA over a schoolboy but I also believe the government would like to keep a good chance of collision under wraps to save public panic. My question is; is the odd of 1:45000, a measurement in a perfect world where the only gravitational pulls are the sun and the earth? Or is it more in depth to include other gravitational interferrences... It just seems to me that putting odds on the orbit of an object like this 20 years out, when it was only discovered 4 years ago... is a little optimistic to say the least.